The toughest fortnight in Brad Jones Racing’s history has not stopped the team fielding a record seven Supercars at the WD-40 Phillip Island 500. Its three Virgin Australia Supercars Championship Holdens are supplemented by three Dunlop Super2 Series cars and a single V8 Touring Car Series entry at the Island. Unfortunately for BJR, the first ever triple-header for the Supercars categories follows a horror Symmons Plains that saw heavy damage to its main series and Super2 fleet. Nick Percat, Tim Slade and Tim Blanchard were all involved in the 12-car pile-up on Saturday at Symmons Plains, before Blanchard crashed again on the Sunday. The Super2 entries fared even worse, with a Saturday incident requiring a spare chassis to be built-up for Jack Smith and a new car for Macauley Jones. Team owner Brad Jones feared that the full contingent would not be ready for Phillip Island due to the workload put on his 45-strong staff. 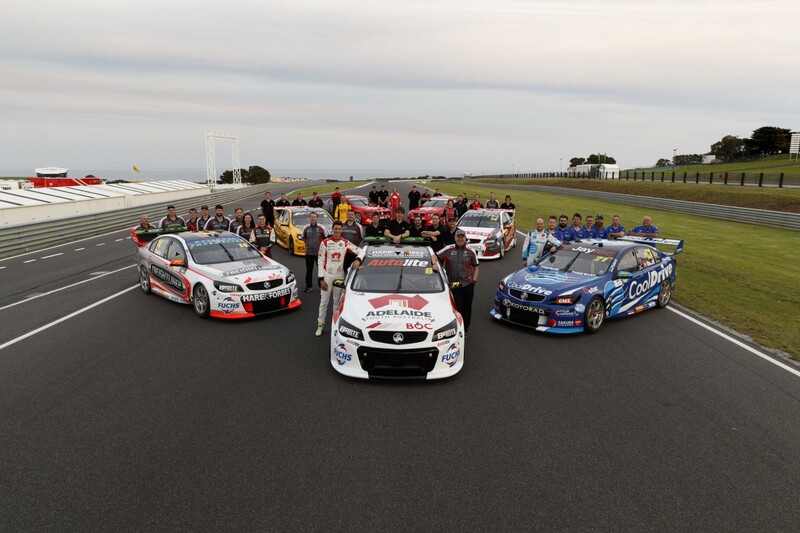 “It has been a massive amount of work and everyone has chipped in,” a proud Jones told Supercars.com as his team assembled for a photo shoot at the circuit. “I was worried that we wouldn’t get the Super2 cars done in time but we did with time to spare. “It didn’t matter which car anyone is assigned to, when someone needed a hand they helped out. “It’s probably the toughest couple of weeks we’ve ever had, but when the chips are down I’d like to think we’re one of the teams that responds the best. Prior to Symmons Plains, BJR had already endured a tough start to the year, which began with star drivers Tim Slade and Nick Percat colliding in Race 1 at the Clipsal 500. New signing Percat then crashed out of the second Adelaide race and Albert Park, with the latter brake failure-induced shunt requiring a major rebuild before Symmons Plains. Amid the drama, both Percat and Slade have shown top 10 pace, leaving Jones optimistic of a strong result this weekend. “I feel this year it hasn’t mattered much which tyre we’re on, we’ve been competitive,” he said. “I’d like to think this weekend we can have #8 (Percat) and #14 (Slade) in the top 10. “Timmy (Blanchard) has been up and down a little bit but if we can get through a weekend where we don’t have any drama I think it’ll be good for everyone. “We’ve gone through so many spares that we’re a bit short on everything so we need a couple of weekends where we don’t damage anything while we replenish our stocks. “But you can’t dwell on the smashing up cars. It happens, it’s part of the business. You’ve got to focus on getting a result at the next one.